Chris originally did his editing in GarageBand, because he wanted to make enhanced podcasts—AAC files with embedded chapters, links, and images—which GarageBand supports. But he found editing in that app tedious. Among other things, it lacks a ripple-delete function, which automatically moves the audio following a section you’re cutting to the point where you made the cut. Also, he found GarageBand’s audio effects and noise-removal tool too limited, and there’s no built-in way to remove plosives. Scanning overall volume levels in Audition. After making repairs and cuts where necessary, he exports the results as a mono AIFF track, which he then imports into GarageBand 6. There, he inserts opening and closing remarks and any ads he might have. He moves the elements into place, adds opening and closing theme music, and draws in fades (fading the music out as a voice comes in, for example). Then he adds the enhancements: adding chapters and graphics, applying URLs to chapters, adding a description, and mucking with the metadata that will appear in iTunes. Finally, he exports it as a mono spoken podcast to iTunes. It's not like Macs have a monopoly on podcast editors. She adds sound effects occasionally. (For example, when someone accidentally swears, she replaces it with the sound of the Doctor Who’s sonic screwdriver). When transitioning from one segment to another, she use a the sound of a Vardan gun from the show. She has a template saved in Movie Studio Platinum with tracks for music, sound effects, and separate audio files. The music track has the opening theme in roughly the spot it should be. The tracks for the separate audio files already have compression applied and the EQ tweaked for that particular participant’s voice. She opens the template, saves it as the new episode, and deletes the tracks for the contributors who don’t appear on that episode. When she receives the MP3 files from that week’s guests, she inserts them in the appropriate tracks, lines them up, trims off the extra chatter at the beginning and end, and adds the closing theme music. She also uses noise gates for any files that have distracting ambient noise. If there was a problem with Skype during the call, she’ll edit out any downtime in the middle. She’ll also check her notes to see if there were any offending background sounds that need attention. She then renders the project as an MP3 at 96kbps. 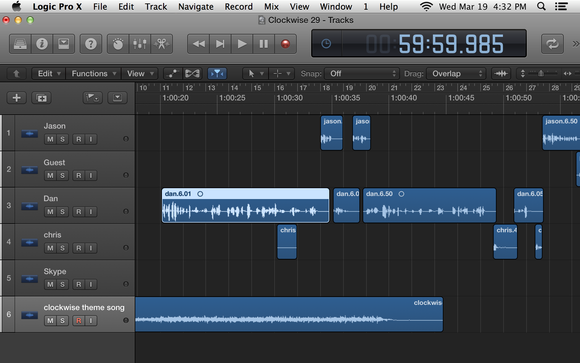 In Logic Pro X, Jason splices together individual tracks from each podcast participant. His workflow goes like this: First, everybody sends him their files. (Most people just use Dropbox: He has a shared folder there that panelists can join.) He uses the conversion tools that come with Call Recorder to convert all files to an uncompressed audio file (AIFF). He then brings each individual file into Logic as its own track. He also imports the Call Recorder recording, which contains everyone else’s voices as he heard them on Skype; he uses that track to sync up the conversation, so everybody’s separately recorded tracks line up in the proper time. Once that’s done, he deletes the Skype track from Logic. Once everything is in Logic, he uses the Strip Silence command to delete all portions of everyone’s audio track where there’s nothing making noise. This has the effect of leaving behind only the parts of their track when people are speaking, making it easy to edit the podcast visually. He works through the podcast from start to finish, often not even listening to long monologues unless he sees a pause or something else that needs to be edited. He also remembers things that happened during recording that need to be fixed (such as somebody swearing or digressing). If the podcast has advertising, he records them separately and drops them in. The only sound-effect he uses is something he calls the “Spoiler Horn”, to warn people when there’s discussions of something spoiler-y; it’s actually a stock Apple sound-effect called Ferry Fog Horn. Once he’s done with all that, he export the results to AIFF format, converts that to MP3 using iTunes, and uploads it to the website that hosts his podcast. 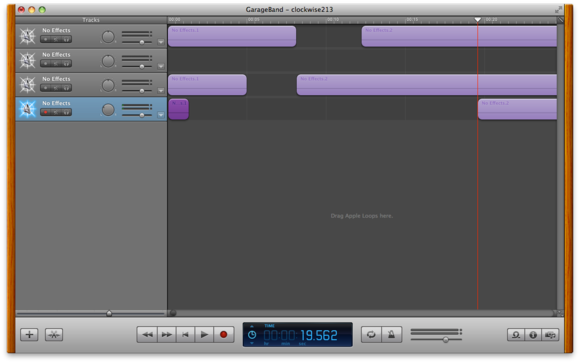 You can indeed edit podcasts in Garageband, though it's easier if they're short.